A new volume, Key Concepts in Public Archaeology, edited by Gabriel Moschenska of UCL has been published (UCL Press) [open access pdf]. Readers of LM will find some of the chapters of interest. 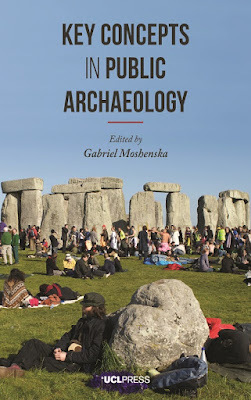 Paul Burtenshaw ("Economics in public archaeology", pp. 31–42) touches on how to reduce looting and preserve sites by showing the economic benefits of heritage through tourism. Don Henson ("Archaeology and education", pp. 43–59) shows how education can be used to reduce the risk of looting. Roger Bland, Michael Lewis, Daniel Pett, Ian Richardson, Katherine Robbins, and Rob Webley write on "The Treasure Act and Portable Antiquities Scheme in England and Wales" (pp. 107–121). They have a section on the Staffordshire Hoard with the subtitle, "archaeology captures the public imagination". The authors respond to criticisms (without citing any studies; see the Forum discussion in Papers from the Institute of Archaeology apparently unknown to the authors) that the scheme has not stopped illegal metal-detecting, described by the term "nighthawking". It would have been helpful for the authors to have discussed the case of the so-called Crosby Garrett helmet (but discussed by me in a later chapter) or the Lenborough Hoard. I have a chapter on "The market for ancient art" (pp. 187–200). This includes sections on the scale of the market, suggesting that there have been over-estimates used. I also discuss metal-detecting, the impact of the Medici Conspiracy, and the fabrication of object histories.